I am totally in love with Stephanie Perkins's work. For reals. I loved Anna and the French Kiss so much that I had absolutely zero doubts that I would love Lola and the Boy Next Door too. And you know what? This book was left sitting on my shelf for far too long. I don't know why I didn't read it sooner (well, actually I do know why. i just like saying that) because this book is just so gosh darn adorable! Stephanie Perkins is quickly being cemented as one of my favourite YA authors because I just couldn't get enough of this book. Lola is the story of Lola Nolan, an aspiring costume designer who lives in San Francisco with her two dads and has an older hot rocker boyfriend, who her parents aren't particularly fond of. And then one day, her old neighbours from when she was a kid, Cricket and Calliope, move back next door and screw things up for Lola. Compared to Anna and the French Kiss, this story is just a little more of an everyday circumstance, but it isn't any less wonderful or magical. Lola's story made me feel everything: I laughed, I felt bad for people, and I definitely got that magical-ness that was also in Anna. I don't know if I would call this a first love story because Lola already has a boyfriend at the beginning of the book, but it definitely felt that way. There was only one thing in the entire book that I didn't like and that was the numerous descriptions of Lola's outfits. Bad fanfiction has taught my to just not care about what a character is wearing because most of the time it's not necessary. But since Lola is a costume designer, I kind of expected this to be an ongoing thing since the first description. That doesn't mean I have to like it though. As with Anna and the French Kiss, Lola and the Boy Next Door has a cast of awesome characters. I loved every single one of them! Our main character, Lola is incredibly quirky but she's not the kind of quirky where a person is so out there that it makes them a little hard to like. No, she's not like that at all. Lola is very unique compared to other quirky YA girls. She's an artsy person, but she can still be relatable depending on the reader. I felt like I could somewhat relate to Lola because at one point (I hope this isn't a spoiler!) she is told by another character that she doesn't exactly know who she is, and the way she dresses reflects that. And while that's not necessarily true, I could definitely relate to that because throughout my teenage years, which are slowly coming to an uneventful end, I went through about three different phases and I'm still not entire sure of who exactly I am (although I'm too lazy and insecure to experiment with things). But despite that, I love Lola's bubbly personality and loyalty to her friends, which made her a completely loveable MC. As for Cricket, he is definitely my new book boyfriend and I want him all for myself. This dude is pretty much the guy of my dreams: he's kind, sweet, thoughtful, smart, and dresses really well. And while I initially thought that I shouldn't like him from little hints that were dropped in the narration, I couldn't help but love him and every time he appeared, I felt like a dog when it sees its owner. Apart from the romance aspect of the book, which is obviously the most important element, Lola is also about growing to become a better person and making hard decisions that sting at first but will ultimately make things better. I liked that this was also an important part of the story because it shows that romance isn't everything in life. It's nice to have someone (says the girl who's never had a boyfriend), but it's very important to do things that will better your life, even if it involves breaking off ties with people who are unhealthy to you and unintentionally hurting people. That's just how we grow. 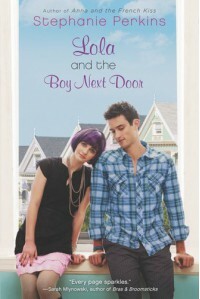 Lola and the Boy Next Door is told in a similar narrative style to Anna and the French Kiss, which is a first-person narrative from Lola's point of view and in the present tense with PLENTY OF CAPS, which in one of the many reasons as to why I love Stephanie Perkins's writing style. She manages to perfectly capture her characters' voices in the narrative, which is both humorous and emotional, and makes reading the books just that more fun and even makes me love her characters even more. I absolutely loved Lola and the Boy Next Door; it's so cute! I loved reading every single word of this book, I just couldn't get enough and didn't want it to end. I loved the story, the romance, and the characters, especially Cricket. If I could magically make Cricket real and have him all to myself, I would be an incredibly happy bunny. Once again, Stephanie Perkins hasn't let me down and I've already pre-ordered my copy of Isla and the Happily Ever After!